Every role is now an information role. From finance to sales and marketing to operations, roles are being redefined to set priorities, evaluate alternatives, make decisions, and take action in response to the latest information. Supporting the needs of information workers requires the delivery of the latest, relevant information at the point of decision. 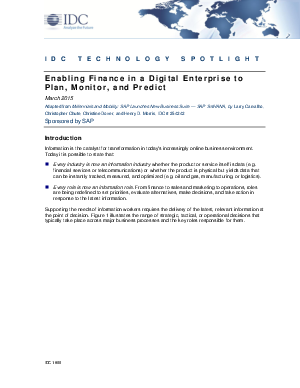 Download this IDC Report to learn how to enable finance in a digital enterprise to plan, monitor, and predict.